Signed and numbered. 60 of 100. 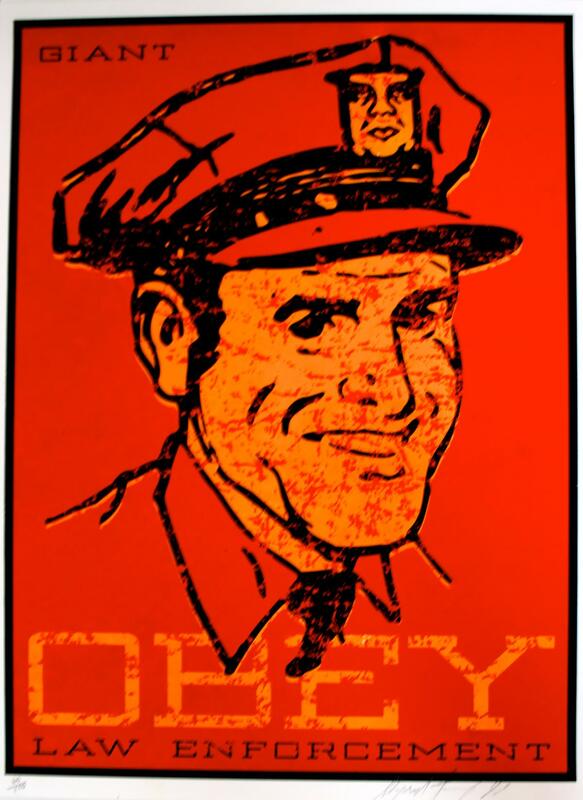 Shepard Fairey's work is a mixture of parody and protest, serves to subvert the very medium to which it attaches itself. Frank Shepard Fairey born on February 15, 1970, in Charleston, South Carolina. In 1992, while still an illustration student at RISD, Fairey started his first business venture, Alternate Graphics, to showcase his emerging design and silkscreen printing talents. He created stickers, t-shirts, skateboards, and posters which were all available via black and white mail order catalogs that he distributed. He also did small commercial printing jobs for clients to help cover some of his expenses. In 1994, Helen Stickler created a documentary film, Andre the Giant Has a Posse, that focused on Fairey and the growing phenomenon of his subversive stickers and posters. By 1995, Fairey had two or three full-time employees, two of whom were longtime friends from Charleston, whom he had known through his many years of skateboarding. During this time, he also created a small sister brand, Subliminal Projects, with Blaize Blouin, and released several skateboard and poster designs using this moniker. Fairey created a skateboard video, ADD (Attention Deficit Disorder), that showcased the small group of skateboarders that he sponsored via Alternate Graphics. In 1996, Fairey moved from Providence, RI, to San Diego, CA, to partner with Andy Howell in Giant Distribution. Shortly thereafter, Fairey partnered up with Dave Kinsey, Phillip De Wolff, and Howell to form First Bureau of Imagery, FBI, a branding, marketing and design firm targeting the emerging action sports market. In 1999, FBI was dissolved and Fairey, Kinsey, and De Wolff formed BLK/MRKT, another branding, marketing, and design firm. During this time, Fairey met his future wife, Amanda Ayala, who began working with him. In 2001, the BLK/MRKT offices were moved from San Diego to Los Angeles and expanded to include a small art gallery. De Wolff's partnership was purchased by Fairey and Kinsey, who became the sole proprietors of the operation, now doing business from an office in the historic Wiltern building located in Koreatown. In 2003, Fairey and Kinsey decided to make a professional split; Fairey kept the location and most of the employees, renamed his agency Studio Number One, and renamed the art gallery Subliminal Projects. Kinsey took the name BLK/MRKT and its gallery, and relocated it to Culver City, CA, where it is still in operation. In 2004, Fairey teamed up with longtime friend Roger Gastman to create a quarterly publication, Swindle. The magazine documents pop culture, fashion, and music, and each issue is released in both soft cover and hardcover. In 2006, Fairey released a comprehensive, hardcover monograph, Supply and Demand, that documents much of his personal and professional design work. The entire book was designed in-house at Studio Number One and it is published by Ginko Press. It is currently in its third edition. Fairey married Amanda Ayala in December of 2001 in Charleston, SC. In June 2005 Amanda gave birth to their first child, daughter Vivienne, named after punk fashion icon, Vivienne Westwood. In January of 2008, their second daughter, Madeline, was born. Fairey’s images range in subject from counter-revolutionaries and rock stars to updated takes on political propaganda posters. Marked by the artist’s bold graphic style and provocative messages, the images are visually arresting, yet open-ended and ambiguous in intent.